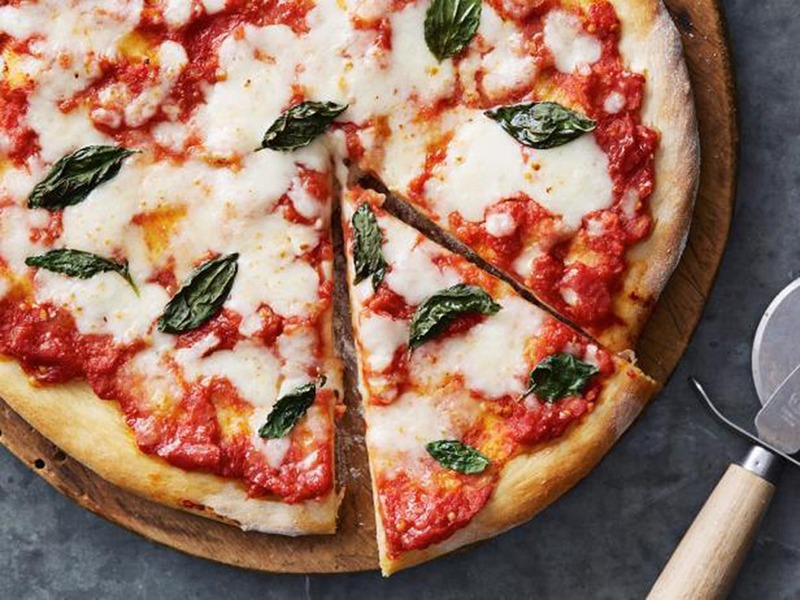 Authentic Italian Recipe: Margherita Pizza - Found in Italy! Directions: Preheat a wood-fired pizza oven to very hot 4 hours before cooking. Alternately, you can use a preheated pizza stone in your home oven. It's best to heat it for 1 hour at 500 degrees F before baking. Add tomatoes to a food processor and process until smooth. Season with salt. Sprinkle some flour on your pizza peel. Using a rolling pin, stretch your dough to a very thin 10-inch round. Using a spoon to spread, put 1/4 of the sauce on the dough, and spread leaving a 1-inch border. Sprinkle 1/4 of the mozzarella over the sauce. Gently put the pizza on the floor of the pizza oven. Bake until golden and crisp, about 3 minutes. Top with hand torn basil. In the bowl of a stand mixer, add the yeast, lukewarm water, and 1/2 cup bread flour. Mix well and let sit until bubbly, about 30 minutes. Whisk together the remaining 3 1/2 cups bread flour and salt in another bowl so it will be evenly distributed. Once the yeast mixture is nice and bubbly and looks like foamy beer, add 3/4 cup cold water and olive oil. Using a dough hook, turn the mixer on and add the flour in increments. Mix the dough for about 5 minutes, until the dough starts creeping up the dough hook and comes away from the sides of the bowl. Place the dough in a large bowl lightly greased with olive oil. Turn to coat all sides of the dough with oil. Cover the bowl loosely with a clean tea towel. Let rise until doubled in size, about 2 hours. Punch dough down, and let rise another hour. Divide the dough into 4 equal disks. Lightly flour a work surface. Using your fingers or heels of your hands (and a rolling pin, if you prefer) stretch the disks out to a 10-inch round. Repeat with the remaining 3 pizza dough disks.